I've completed my second project for Britex, which you can see on the Britex blog. I used two yards of a striking navy and turquoise coating (90% wool and 10% poly) from Britex to make myself a winter coat. This coating has the look of a handwoven fabric and I love the mix of navy and turquoise. It is lined with teal Bemberg lining. I used a size Large (16-18). 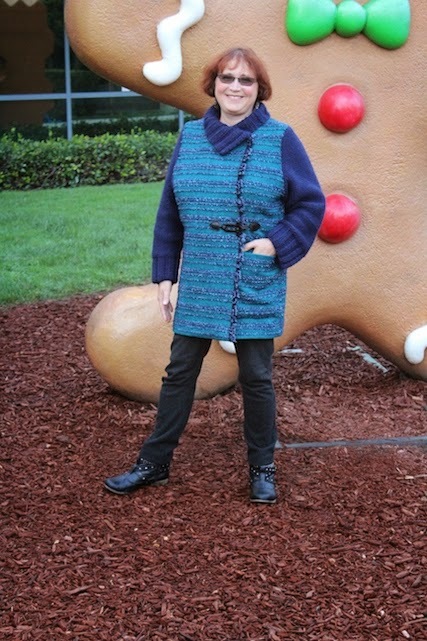 The pattern says it is "very loose fitting", and it is. Despite the fact that this is a fairly simple pattern, I made many changes, some for fit and some for style. As I mentioned, the pattern is very loose fitting. I didn't need any additional width for my bust (very unusual), so I did a vertical-only FBA. In the end, I didn't need to sew in the dart, as the fabric is loosely woven enough that I was able to ease the dart into the side seam. I also did some easing to bring in the armscye at the bust. This is a subtle detail that improves the fit. The armhole on this pattern is very large and low and the shoulder is extended. I dislike an extended shoulder, so I narrowed the shoulder by almost 2". As a result, I also raised the sleeve cap on the sleeve. I did not otherwise modify the large armhole, so pay attention if you don't like a large armhole. I wanted a wider front facing, so I redrafted it. Omitted fullness at the hip. Omitted the collar pattern and replaced it with a single-thickness knitted collar. Shortened the sleeve by 1", which is pretty typical. I could have shortened it another 1/2" - 1". I raised the sleeve cap, which was rather flat shaped, suitable for an extended sleeve. Finally, instead of a fabric sleeve, I knitted the sleeves. The fabric is striped, so I cut it out single thickness, matching the stripes. For each stitch I sampled, I took careful notes of the gauge of that particular stitch. Having an accurate gauge is crucial when you graph out the pattern. 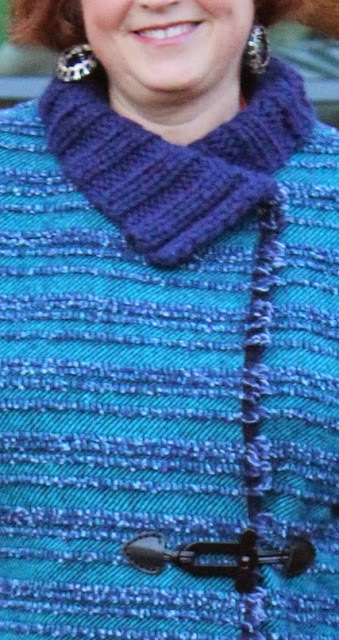 Knitting the collar: A 2x2 rib has a 4-stitch repeat: Knit 2, Purl 2. I determined that I needed to cast on 68 stitches so that the resulting collar would fit the neckline. I knit in 2x2 rib for approximately 4-1/2", using my normal tension, which is a bit loose. I cast off and blocked the collar. Attaching the collar to the coat:: I underlapped the knitted collar by about 1/2" to the inside of the neckline, and hand stitched it in place, sewing it twice - once from the front and once from the back. I used a whipstitch which is pretty invisible in the textured knit. Preparing for the sleeves: I completed the entire coat and lining, cleanly finishing the armholes as if I were making a vest. I then tissue fit the sleeve pattern and determined what alterations I needed: I raised the sleeve cap by about 1-1/2" and shortened the sleeve by about 1-1/4". I then removed the seam allowances and hem from the pattern. Armed with my giant plastic ruler and my gauge information, I graphed the sleeve pattern. I wanted the sleeves to be knit more firmly than the collar, so I knitted them with a very tight tension. The final gauge was 4 stitches to the inch, and 4 rows to the inch. This even, easily divisible, number made it easy to graph out the pattern. Knitting the sleeves: There is a left and a right sleeve, since the sleeve cap is shaped with different front and back curves, and I mimicked that when creating the knitted sleeve pattern. I cast on 40 stitches for the sleeve and knit in a 2x2 rib for 4". I then switched to reverse stockinette and finished the sleeve according to the pattern I graphed out, increasing to 50 stitches before decreasing to shape the sleeve cap. When adding stitches (increasing), I used the nearly invisible increase, which is a great technique. I then sewed the sleeves to the coat in the same manner as the collar, by underlapping them in the coat, and sewing (by hand) twice: one from the outside and once from the inside. And, if you don't want to knit it yourself, all is not lost! Did you know that you can BUY knit yardage?! Check out O! Jolly!, based in NYC. I love this coat! The beauty of a style like this is that there are several ways to wear it. You can wear it with the coat fully closed. The collar is held in place with a large snap and it forms an asymmetric neckline that is quite snuggly. You can unsnap the top snap, and create faux lapels. Or you can wear it completely open. Thanks to the Bemberg lining, it easily slips on and off. WHO broke the antenna off the Android!?! WHO would do such a thing!!! I had sooo much fun with this project! I'd been wanting to combine knitting and sewing in a project for at least two years, and this was a perfect use for it. The resulting coat is quite warm, comfy, and easily glides on and off, thanks to the Bermberg lining. I expect to get a lot of wear out of this as the weather cools. I have very little left of the yardage, but I have some fun plans for the scraps! Thanks to Britex for providing the fabric! Thanks to my colleague, Mary Campione, for taking these pics! 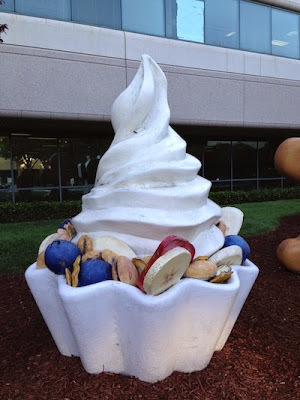 Maybe you are asking, "What is the deal with the seemingly random statues of desserts?!" 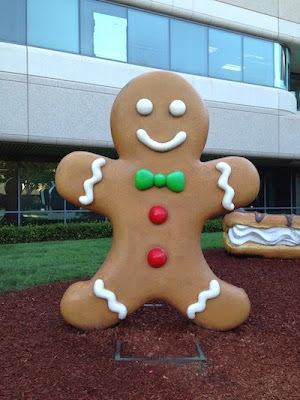 This area, part of the Google Mountain View campus, is known as the Android Sculpture Garden. 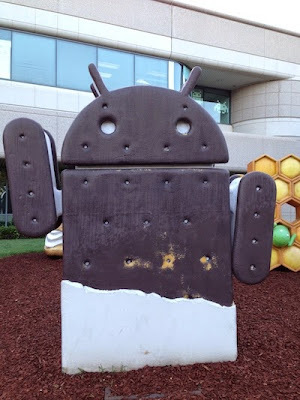 In a nutshell, each Android release is named after a treat, in alphabetical order. 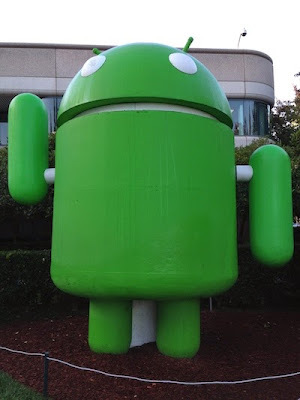 The current Android preview release is the "L release". The "L" treat has not yet been named, or unveiled. I have no inside knowledge, but I think Lollipop would be nice. Or Licorice. Or Dumbledore's favorite muggle candy, Lemon Drops. (There are no "A" or "B" statues, as those releases were called Alpha and Beta, respectively. The treat tradition started with C.
You and your red hair look so pretty in the blues, good choices. I need to take a shoulder seam from extended to ending at the shoulder bone, and am encouraged to see the fine results you achieved. Very cool coat. Great marriage of sewing and knitting. So much to wow about! The fabric is to die for. The color is so complimentary to your coloring. The fit, the details, etc. etc. all is fabulous! This coat looks so right, so great as if it just appeared one day in your closet. Of course you've spilled the beans to reveal your extensive research and development in creating your beautiful coat. Just think what you could do with more than 2 yards! What a great job of knitting! I have a knitting friend visiting but am making her go to Fabric Mart tomorrow before we hit the yarn stores. Wish you were here! Ps new Vogue patterns are out...what do you think? Your coat is beautiful! I love the mix of colors and textures. 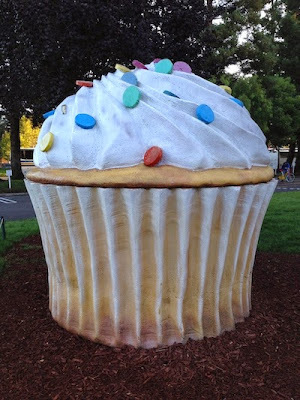 That sculpture garden is hilarious, certainly someplace I would stay far away from lest I succumb to eating too much dessert! Love the coat! The way you put the pieces together really makes it special...and I'm so jealous of the knitting! Gawd it's gorgeous! omegoddess I LOVE the coat! And O!Jolly! ? Dangerous & to die for! What an amazing answer to the latest challenge! 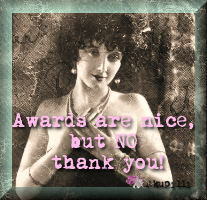 Britex chose wisely when they made you a guest blogger...you put the "C" in creativity! Such fun to follow you on this journey! Wow, I want one too! Might have to learn to knit - can't be that hard???? I love that you knit the sleeves and collar! I love it open. Love. Love. Love!! Great colors for you. I'm exhausted just reading all the work you put into this. But of course, it paid off! 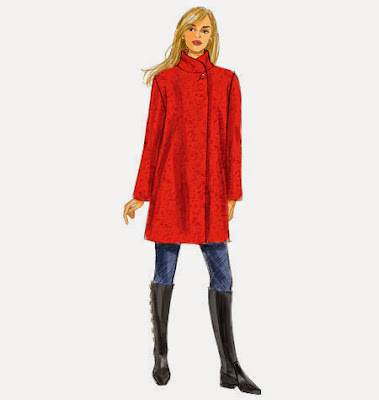 This coat is full of cleverness, from your purposeful use of the selvedges, to the hand knitted collar and sleeves, to the huge pocket and the cool toggle. It's a great look on you and it's so unique, it just speaks "Shams". I am considering using this pattern, and it's very helpful to know about the extended shoulders and large armscyes. 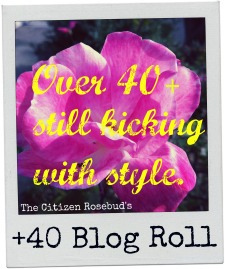 Love your whimsical photos, too. A great blog post, and a most creative make! Great design, great fit, great everything! Love it! Great combination of knitting and sewing. Ingenius mixing of knit and fabric - so you! 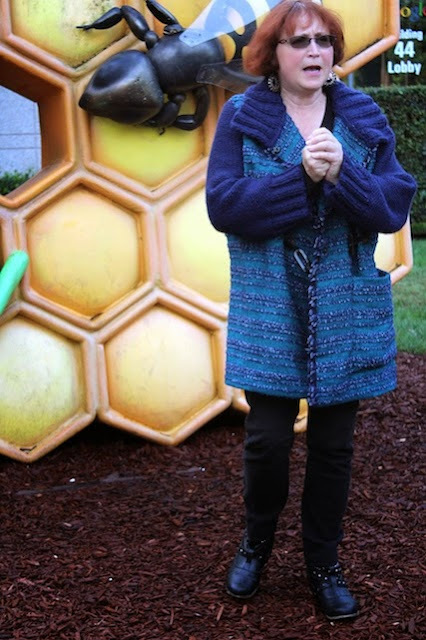 It's like a big cuddly cardigan because of the knit. I never considered combining sewing and knitting. Your coat shows a wonderful combination. In all that is to love about it I especially love the two ways the collar can be worn. Well, I think I want knitted sleeves and collar....I'll just knit it myself. WHAT! Do your talents never cease? You outdid yourself on the coat and photos, Shams! Fantastic alterations, beautiful color of fabric and creative insight. You got lots of great comments on your coat--which is tremendously fabulous! 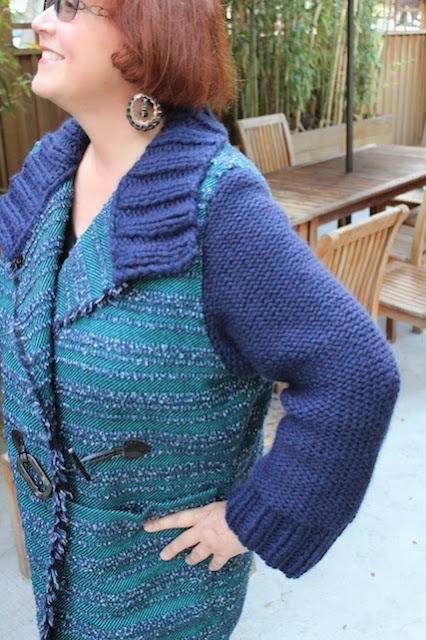 I especially love the fabric and hand knit combo. I have been into knitting a lot of late, but have never considered combining the two. 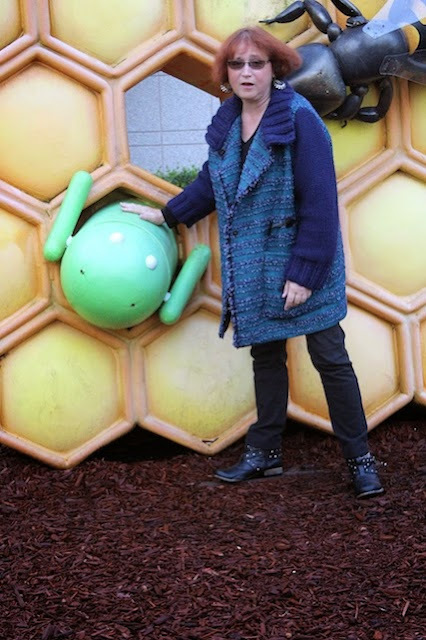 However, I adored your Android Sculpture Garden photos! How cool! I even showed them to my family who thought they were equally cool. 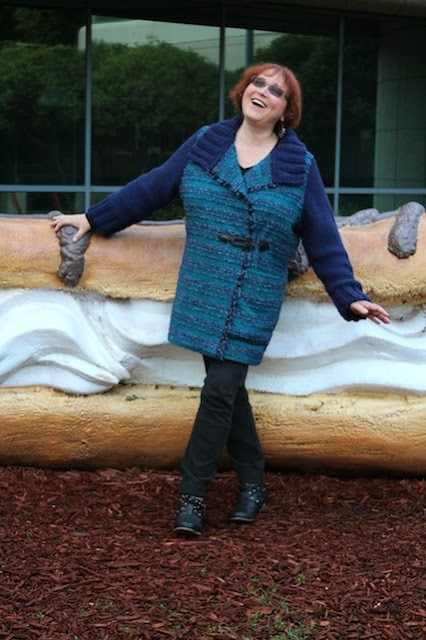 Thanks for sharing photos of you and your coat that were made even more interesting with your choice of background! 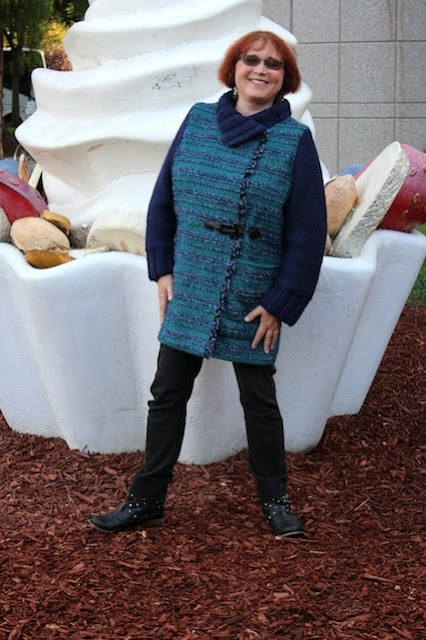 Marvelous coat, fun knitting details, and the location! Very cool post shams!! Love this coat. The colors are so becoming. Love the coat! 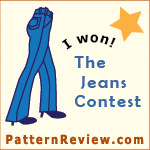 And I love the way you used the selvages. I need to think about that....Love the sculpture garden. One of these days when you come to Seattle for work and have extra time I would love to come to a meet up, or drive you to some favorite fabric stores. The coat, wonderful. The photos, a real treat! You couldn't help but be a little playful wearing that coat! Great colour and love the mix of textures. That is an absolutely stunning coat. Makes me wish for a visit up north sometime this winter... NOT! Great look, though. love your coat - it is gorgeous.